SYDNEY (AP) — Israel Folau is still likely to have his Australian national team contract terminated after meeting with the country's top rugby officials about his anti-gay post on social media. Rugby Australia and New South Wales Rugby Union, who have said they intend to end Folau's deal, talked to the fullback for 10 minutes in Sydney on Friday. "Following today's meeting, the two organizations will update their respective boards on the matter to consider next steps," Rugby Australia said in a statement. "Our joint position regarding Israel Folau is unchanged." Folau, one of the world's best rugby players, ignored a previous warning about the content of his posts on social media when he published a message on his Instagram account late Wednesday saying that hell awaits "drunks, homosexuals, adulterers, liars, fornicators, thieves, atheists, idolators." Despite widespread condemnation of his views, Folau found a supporter in England player Billy Vunipola. Vunipola wrote his own post , saying Folau was trying to say that "how we live our lives needs to be closer to how God intended them to be." "Man was made for woman to procreate, that was the goal no?" Vunipola said. The Rugby Football Union, the governing body of the English game, said it wanted to talk to Vunipola about his comments. "Rugby is an inclusive sport," the RFU said, "and we do not support these views." Vunipola's club, Saracens, also plans to look into the post, saying it is taking this matter "very seriously." "Saracens proudly embraces diversity," the London team said, "and warmly welcomes everyone to the club regardless of race, gender, religion and sexual orientation." RA chief executive Raelene Castle said Thursday that while Folau was entitled to his religious beliefs, "the way in which he has expressed these beliefs is inconsistent with the values of the sport. We want to make it clear that he does not speak for the game with his recent social media posts." 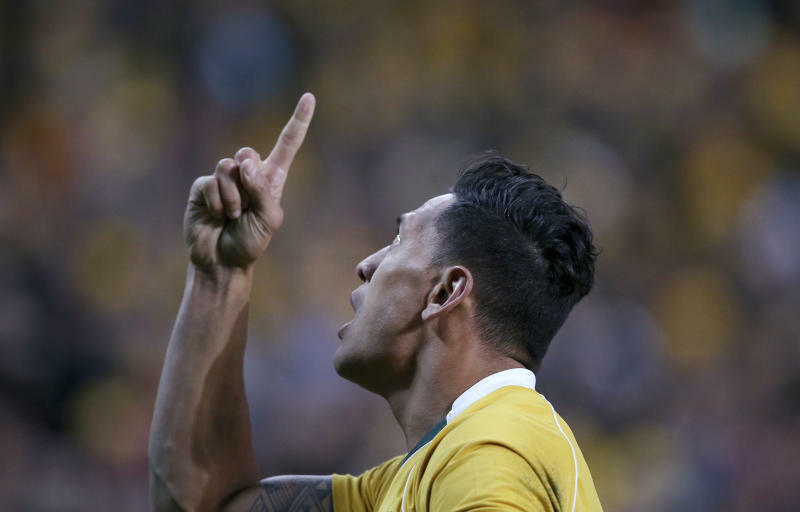 The 30-year-old Folau has played 73 test matches for Australia. Last weekend while playing for the New South Wales Waratahs, Folau scored his 60th try in Super Rugby, the most of any player in the competition, breaking the record of former New Zealand winger Doug Howlett. Two months ago, Folau signed a multimillion-dollar contract extension to remain with the Waratahs and Australian rugby until the end of 2022.